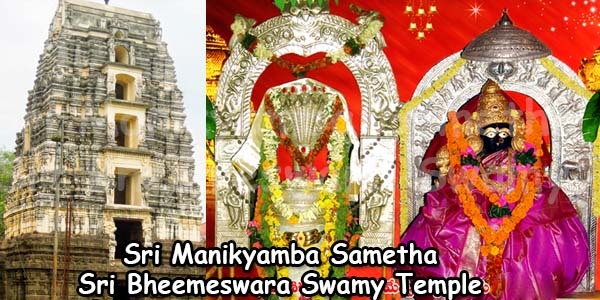 Bhimeswara Temple, located in East Godavari District is also known as “Dakshina Kasi”. 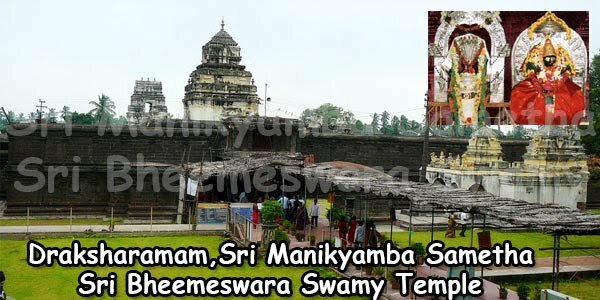 This place along with SreeSailam and Kaleswara constitute the three sacred Shivalingams of the State, hence it got the name “Trilinga Desa”. The Bhimeswara temple at Draksharama has two prakaras. As per the inscriptions the temple was built by Bhima, the Eastern Chalukyan King of Vengi when his kingdom was attacked by the Rashtrakootas. Thus the temple art and architecture shows a combination of sculptural traditions of Chalukya and Chola styles. Ther are four entrances in the outer prakara each having a gopuram, facing the four cardinal directions. The entrance to the inner prakara is on the south, which is lined by a pillared two-storeyed verandah. It is believed that the Saptarishis in order to achieve the results of their penance divided the Godavari River into seven different streams at Draskharama. The streams of Bharadhwaja, Viswamitra and Jamadagni known as Antarvahinies, have gone underground. Devotees can take bathe in the Sapta Godavari Kundam near the temple. 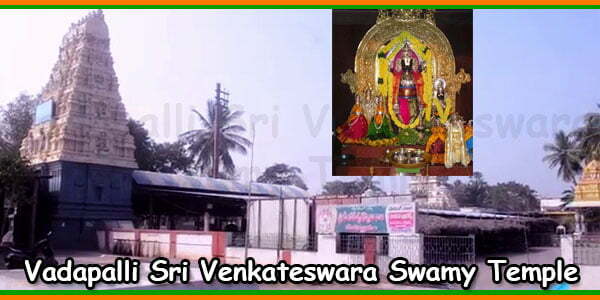 Sivarathri is celebrated in a great scale and attracts huge crowds of pilgrims. The temple has an amazing architecture. The Temple consists of two storied mandapa. The inner Temple is called Garbhagriha which so remarkable with cultural work architecture. Pillars are decorated so beautifully using carved stones. Inscriptions in Telugu, Devanagari, Tamil, and Dravidian can be seen on the stone walls. There are 108 Shiva temples built around this temple. The main temple is two storeyed. Two flights of stairs lead to the upper level of the sanctum. There is a pillared pradakshina on three sides and a Sanctum. 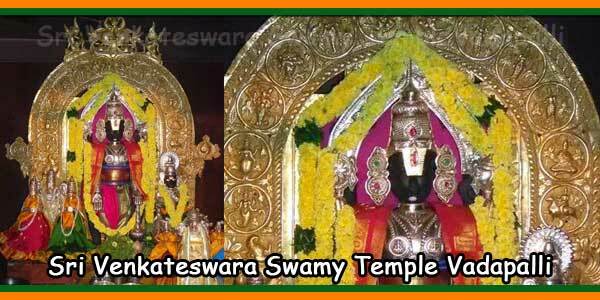 Bhimeswara is in the form of a ten feet high Shivalingam in this Garbhagriha. There is a narrow mandapam on the premises. 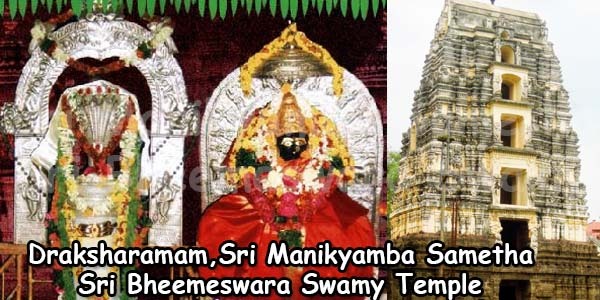 Here, Shiva’s consort is Manikyamba. The temple walls and pillars have decorative carvings of mythological figures. According to the legend, the Idol of Lord Shiva present in the form of Siva linga at this temple was enshrined by the god Surya. It is believed that angels built this temple in one night and the work was unfinished at the sunrise in the early hours. Because of that, the perimeter wall still remains incomplete. It is believed that one part of 18 pieces of Sati Devi fell here and hence this place is considered as one of the eighteen Shakti Peethas. The Siva Linga present in this temple is a large crystal of 2.6-meter height, which is the unique feature of this ancient temple. Some priests of this temple found 108 temples of Lord Shiva built around 40 km radius of this temple. A legend of this temple also mentions that the inner walls of the temple were once filled with diamonds and because of that the required light for darshan was available. But when Aurangzeb invaded the temple to loot the diamonds, those diamonds turned into stones making the inner sanctum dark. 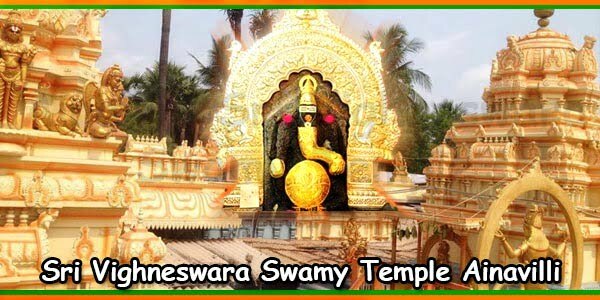 If a devotee donates Rs.5000, Abhishekam, Kumkuma Abhishekam will be performed on a selected day by the donor for 10 years and prasadam will be send by post.